Our reliable SSD business cloud web hosting is easy to use and provides your business with unlimited resources and features to host your website. Our business packages are feature rich and are deployed on cloud based servers. All this at cost effective prices to suit your business. Our business web hosting plans use 100% SSD drives to power your website. This ensures a fast and resilient platform for which your websites are hosted on. We also use cloud based load balancers to ensure that there is no single point of failure. This combination ensures that you have the best performance possible. As standard your business web hosting plan includes FREE SSL certificates that will protect each and everyone of you domains that are hosted with us. We deploy wildcard SSL certificates to ensure maximum protection for all your domains and services. We provide huge 10GB per email box to use with your business web hosting plans as standard. Our data centres are located in the UK in Manchester, Leeds & London for our business web hosting. PHP7 is enabled by default but you can easily switch to earlier versions of PHP via your control panel. We provide a PCI-DSS (Payment Card Industry Data Security Standard) compliant hosting environment for you to securely process your online payments. We actively manage our business web hosting solutions to ensure they are kept up to date with PCI requirements. Moving your website(s) from another provider doesn’t have to be a pain. We can assist you to transfer and migrate your existing website to our web hosting. We will assist you in moving over all your website files, databases and even you email accounts and data. 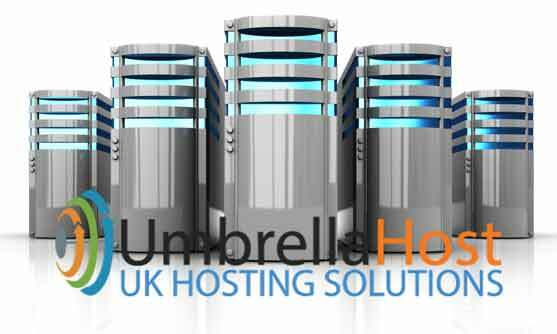 All our business web hosting plans at Umbrella Host include full features as standard. The business web hosting plans differ in only the amount of domains you want to host, disk space required and additional sub domains you need. Everything else is included as standard. Is there a minimum contract term? Is your hosting HIPAA compliant? Will my emails be secure? What Support do you provide? How do I setup an SSL? Will your prices change? Can I upgrade my plan? No, all our web hosting plans are without commitments. they are on a month by month basis. We don’t tie you into a 12-month term. You can either pay monthly or on a yearly basis, whichever suits you. If you signup to pay for 12 months we also give you a discount over the standard monthly fee. No, HIPAA compliance is extremely complicated and involves more than just setting up and configuring a web server. At this time we are unable to provide HIPAA compliant plans. We are however PCI-DSS compliant which for the majority of users is more than sufficient to comply with strict PCI requirements. In a word, Yes. You can turn on authentication for your domain by enabling SPF and DKIM records which will verify that emails originating from your domain are in fact from you. Enabling SPF & DKIM for your domains(s) prevents spoofing and ensures that your emails land in the recipients inbox and not spam folder.